Combat Redefined Part 1 Preview: Loot, Levels and Upgrades! With the announcement of the Combat Redefined series of updates we promised to make Dino Storm combat more varied, more fair and more fun. Today we also give you more details: This is a preview of Combat Redefined Part 1 – get ready for an amazing update! Get More and Better Loot! Purchase Already Upgraded Dinosaurs and Weapons! You kept asking for it, Combat Redefined Part 1 delivers: Soon you will be able to purchase already upgraded dinosaurs and weapons as well as dinosaur implants and weapon tech! 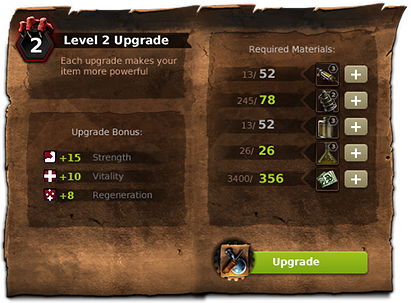 Note that the selection of items on offer depends on your level, just like upgrades do. “My name is Buck Norris and I want to know more. Buck: Do I have to upgrade all my dinos and weapons again? The Dino Storm Team: No. We improved the overall balancing though, so you might notice small changes in perceived strength. A dinosaur upgraded before the update is just as powerful as a dinosaur that was upgraded after the update. Do I need to learn how to do upgrades from scratch? We don’t think so. The upgrade items change and the upgrade window gets a fresh new design, but it basically works like before. Upgrades are still started at the Dino Doctor and Weapon Expert in Dinoville. Is it true that quests do not reward upgrade items anymore? Yes. 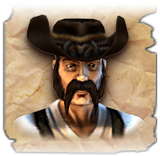 Quests instead reward you with more experience points for boosting your level, and also Gold Coins – both depending on your performance during the quest. How can I get the new upgrade items then? just click the + button next to it in the upgrade window and choose “Where can I find this?” for directions. What happens with all the old upgrade items I still own? Evolution Serums, Gun Tuning Kits, Weapon Tech Upgrade Kits and Dino Implant Upgrade Kits will be removed from the game completely. You will automatically receive a refund in Dino Dollars for any of these items removed from your possessions. What benefits do I get from DINO STORM PLUS, now that the old upgrade items get removed? DINO STORM PLUS now grants you double Experience Points from any completed quest or group quest to speed up your leveling progress. Remember that your level is now key to unlocking upgrades, so DINO STORM PLUS still enables you to max out your items in next to no time! Will there be changes to the achievements as well? Yes. Since fashionable Fame Items are now dropped by enemy units, these will no longer be rewarded through achievements. Completing achievements will reward you with Fame instead. So the dinosaurs stay exactly the way they were? No changes apart from balancing tweaks? Well there is one thing we wanted to keep as a surprise, but since you are asking: All dinosaurs in Dino Storm will move a lot faster after the update! So much in fact that we need to remove Accelerator Potions from the game. As with the old Upgrade Items, you will automatically receive a refund for any potion you own, and if you bought them from the Express Store you will also get back Gold Coins instead of Dino Dollars. Do you want to join the Combat Redefined discussion? Head to the forums!